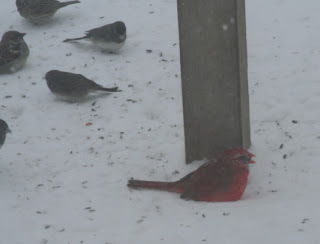 Such a treat it is to have a cardinal visit the feeder! By far my most favorite bird. 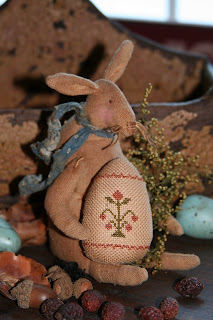 In about mid to late February he will start singing his courting song. He sings the song only during the mating season. The cardinals do mate for life. During the mating season a male cardinal can be seen feeding the female...what a guy! 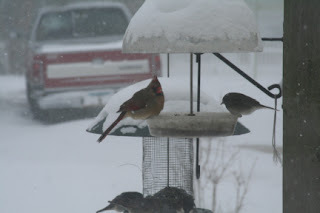 A female cardinal visiting....brrrr she looks cold! A Downy Woodpecker enjoying some suet. 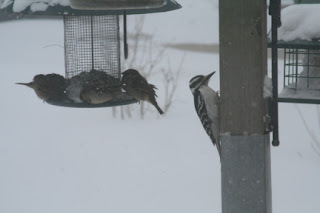 The Downy's and the Hairy's look the same but the Downy is larger in size and has a much longer beak. 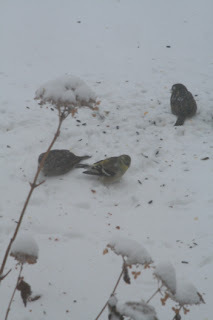 These little guys visit the suet blocks several times a day. 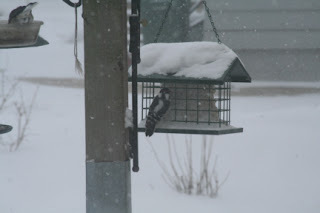 Here is a Hairy Woodpecker...going to have some suet for lunch. e is a Goldfinch dressed in her winter colors. This is our State Bird and as Spring approaches his feathers will turn a brilliant yellow. 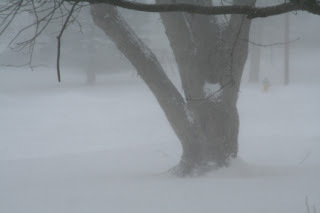 These birds visit our feeders in small flocks.